Help cute little critters traverse safely across colorful lands in Melbits World for PS4. The Melbits kind of remind me of Teletubbies, except much cuter and less annoying. 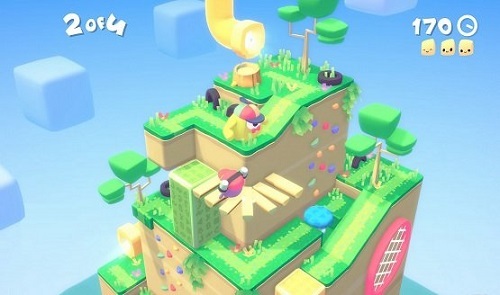 Gameplay is a mix of Lemmings and Captain Toad. The Melbits will follow a path blindly, and you must manipulate objects in a 3-D isometric area to make sure they arrive from point A to point B without harm. But the most unique thing about the game is how you control it. You don’t use a PS4 controller, but your cell phone instead! In order to play Melbits World, you’ll have to download a special app to your smartphone or tablet. Then you must make sure that all devices are connected to the same WiFi spot that the PS4 is on. It’s really easy to figure out. In every level, each player will have two main different buttons they can use to manipulate objects, as well as buttons to pause the game and whatnot. You might have to tap a button on the touch screen to move blocks to different positions. Or slide a lever down and then release it to make a trampoline send one of the Melbits sky high, if your timing is right. And sometimes you might even have to rotate your whole phone to spin a log on screen so the Melbits will have a path to walk on. Along the way are goodies that the Melbits can collect if they walk over them, and if they can bring them to the exit, you’ll earn goodies like new Melbits to play as, or stickers you can put in an album. I wanted to like this game so much, I REALLY did. I love cute and colorful puzzle action games, and I think the PS4, nay, the world, needs more games like this. But I couldn’t get past the problems this game has. First of all, it’s a multiplayer only game. You HAVE to have two or more people to play it. You can’t even get past the character selection screen with one person. It makes for a great teamwork and cooperation exercise, but with a few simple level tweaks, they could’ve made this one accessible to single players as well, and I think it would’ve been easy to implement. The other main problem I had with the game is how you control it with your tablet or smartphone. I can understand why they did this, since tablets and smartphones are more commonplace than PS4 controllers. But why couldn’t they let you use both? The things the tablets and smartphones can do for you in the game, the PS4 controllers can do just as well also. Plus, when rotating your phone to move logs, it’s hard to tell which way to rotate to keep your Melbits on. Worst of all, both my smartphone and tablet would disconnect nearly every level. I don’t know if it’s because I have crappy internet (I don’t think so), but it sure made it hard to play with that going on. Even though I kind of bashed this game in my main review, if you have a family or a bunch of friends, each with their own tablet or smartphone, this game would probably be great. Your Melbits can fall off ledges or in water, but that’s about as violent as it gets. Reading skill is helpful for some of the text and menus, but not necessary just to play. Melbits World is rated E for Everyone. Thanks for your review Gamer DAD!!! We are glad taht you like it! The production version that is now available in PSN improves a lot in phone stability and motion sensing, It is different from the test version since the you tried one does not get the updates! . We strongly encourage you to update and enjoy the game again with kids and family on a pizza sunday! We are also gals to know that you will be interested in the solo and gamepad versions we have in teh kitchen!